Abstract: This research background is based on conventional teaching activity of social studies where teacher explains material with speech method without using anyinteresting media for attracting student’s attention. Students just write teacher’sexplanation and are not active in the teaching and learning activities. This way ofteaching makes students feel bored, do not pay attention of teacher’s explanation andbecome easy forgetting the material. This way of teaching also decreases student’sscore in social science. So, it needs a problem solving by using a teaching medianamed “ Smart Tree “. The goal of this research is investigating the activity of teacher,student’s level of activity, student’s score of social studies before and after implement“ Smart Tree “ game, and problem arising during teaching learning process. Thisresearch uses classroom action research. The subject of this research are 24 fifthgraders of SDI Al Hadad Singgahan Tuban. The instrument of collecting data useobservation, test and interview. In teaching learning process the score of teacher’sactivities increases from 70% in first cycle, 85,83% in second cycle, and 95,83% inthird cycle. Then the score of student’s activities increases from 66,80% in first cycle,72,77% in second cycle, and 87,50% in third cycle. Furthermore, the score of studentsstudying increases from 33,33% in the first observation, 70,83% in first cycle, 83,33%in second cycle, and 87,50% in third cycle. From the result, we can conclude that “smart tree “ game in teaching social studies can improve student’s score in fifth gradeof SDI Al Hadad Singgahan Tuban. WIRATSIWI, Wendri. PEMANFAATAN MEDIA PEMBELAJARAN PERMAINAN POHON PINTAR UNTUK MENINGKATKAN HASIL BELAJAR PADA MATA PELAJARAN IPS SISWA KELAS IV SDI AL HADAD SINGGAHAN TUBAN. JURNAL PENDIDIKAN DASAR NUSANTARA, [S.l. ], v. 1, n. 2, jan. 2016. ISSN 2579-6461. 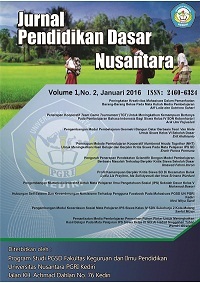 Available at: <http://ojs.unpkediri.ac.id/index.php/pgsd/article/view/215>. Date accessed: 25 apr. 2019.